Quick Thoughts: SONS OF ANARCHY, "Hands"
Sons of Anarchy continued its crazy ride towards the Season 4 finale as we all got to see how Clay's ambition and greed could end up costing him everything which could lead to the downfall of the only thing he ever loved...the MC. 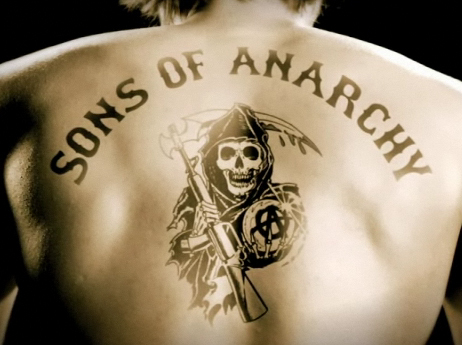 Saying that "Hands" was the best episode of Sons of Anarchy to date is not that much of a stretch. Everything that's been going on during this season has been leading up to the events of this outing, but I was still shocked by most of it especially everything the involved Clay and Gemma. The consensus around the Internet is there's no way Clay can survive past this season, which I don't quite buy but more on that later, but I'm interested to see how this all ends up. The other couple on the show also had some serious drama to deal with as Tara's life was threatened but survived the attack. We all knew early on in the season that Tara was in seriously trouble, so we shouldn't have been surprised that Clay did what he did, but it was still captivating to watch thanks to those moments between her and Jax. I was also glad to see how the other season-long arc, Juice being manipulated by Potter, will finally collide with everything else that's been going on in Charming. I know that the kick-off of this story, him being afraid that his racial makeup will affect his standing with the Sons, was shaky for most but at least they've been able to get away from it to tie it in with the rest of the season. Now, I don't usually like to predict what's going to happen because that can take away from the experience of watching season as a whole. Like I mentioned earlier, there are some out there who will think this season of Sons will be a failure if Clay lives, and I'm not on board with that theory. As a viewer, I can see Clay living and still giving the audience a decent payoff. For example, the Sons will find out what Clay's done, and there might be an attempt on his life (I can see Opie taking up this task), but he'll either be taken down by Juice (who will have come clean with the club to help orchestrate Clay's downfall) or will be on the run with the Sons on his trail for revenge. I just cannot see Kurt Sutter killing off Clay at this point of the story, but he will eventually. Unfortunately, I can't say the same about Tara and/or Opie. I'm not going to be upset if my theory doesn't come to light, but I'm afraid so many people are taking an all or nothing approach to the end of this arc, which doesn't make any sense to me. So whether Clay lives or dies by season's end, I will say that so far SoA has been entertaining as heck to watch week after week. Can't wait to see where things go from here.